It used to be that you kept what ever kind of water heater your house or condo came with, and when it died, you replaced it with the same type of water heater. Today there are many more water heater choices, and you might want to investigate various water heater models before you call a plumber or water heater company about water heater replacement. Water heater 101– which one is right for me? We’ve been installing water heaters since 1957 and have aggregated the most common questions. What is the energy efficiency? It can go from 60% on a tank up to 98% on tankless models. What will it cost? 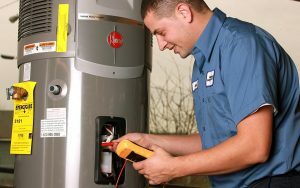 Water heaters can run from under $1000 for an electric tank model installed to over $4000 for a top of the line tankless. How long will it last? A standard tank may only last 8 years but tankless may last over 20 and there’s one new type of tank with a lifetime warranty. Are there maintenance requirements? Your standard tank likely has recommended maintenance, including annual draining to remove silt. This is normally required to maintain warranties. Are there rebate opportunities? Some highly energy efficient water heater models, such as heat pump water heaters and combo boilers, have Seattle utility rebates that help offset their higher costs. If you live North, Cascade Natural Gas has rebates on tankless water heaters as well. What energy source do they run off of? Water heaters come in electric, gas, propane, or solar water heaters. Tankless water heaters only come in gas or propane. What comfort features can I get? On-demand or continuous hot water from a tankless water heater is great, and instant hot water can come from a recirculating pump. A recirculating system can be added to most water heaters. How many gallons per hour can it supply? The amount of hot water in gallons that the water heater can supply per hour (when starting with a full tank), its also known as a first hour rating. Standard tanks are less than 100, as they empty and then need time to refill hot. Tankless water heaters have much greater hot water capacity. And you might want to ask about how fast it refills if it’s a tank water heater. How much space will it take up? Standard tanks, you need about a 3 ft square space, Tankless water heaters are the size of a carry-on bag and mount on the wall, and heat pump water heaters need significant space around them to function properly. Can they do multi-purpose heating? Boilers based on tankless technology, can today heat your house and water and provide radiant floor heating. Wow, that’s a lot to consider. Here’s how some of the most popular options stack up! Expensive on going cost – electricity is used 24 hours a day to keep water heated. Maintenance: Depends on model selected. Some electric water heater models build up excessive silt, which reduces capacity and efficiency build up. The main benefits of using an electric water heater is low upfront costs and ease of replacement. Considerations are short life span and loss of efficiency as they age if you do not maintain them. If you have an electrically heated home and are using an electric water heater in a reasonably open space, such as a daylight basement or garage, you could consider a hybrid electric water heater, also called a heat pump water heater. These cost more upfront but are highly energy efficient. Natural Gas Water Heaters are more cost efficient to operate on going than electric water heaters which is why they are becoming more popular. They typically come in 40 gallon and 50 gallon sizes, although we have larger sizes and expansion tanks available. The lower cost of gas as a fuel source combined with a relatively low initial investment makes standard tank gas water heaters attractive. Venting: Either B-Vent (uses same chimney as furnace with separate venting) or Direct Vent – directly vent to the outside of your house, so there is added upfront cost to provide proper piping and venting. Maintenance: same as electric water heaters, it varies by manufacturer and model of gas water heater. Some models prevent or reduce silt build up and rust corrosion. What about propane water heaters? Propane water heaters are far more expensive than natural gas water heaters on a monthly operating cost basis. However, in some areas natural gas may not be available and propane tanks, which come in the same standard types as natural gas water heaters, are popular. There is a real cost advantage to tankless water heaters for a propane heated home because you would not be using nearly as much propane for water heating. The number one home upgrade this year has been the tankless water heater. It’s a small luxury most can afford and you get the comfort of endless hot water and energy efficiency. A tankless can do things a 50 gallon tank could never do, such as simultaneously providing hot water for up to four plumbing fixtures and appliances. (eg: Shower and wash clothes at the same time). Tankless water heaters are about the size of a carry-on suitcase, freeing up space in your home. Use less power, saving up to 30% on the cost to heat water in your home. The typical tankless water heater system does cost more than a standard tank water heater, but it has double the life span. If switching from electric water heater to gas high efficiency tankless, some homeowners may qualify for rebates from PSE. For those who want an electric water heater that is extremely energy efficient, heat pump water heaters provide both. They have the most expensive upfront cost for an electric tank but least expensive on going monthly costs, since your fuel is primarily the heat in the air! EF (energy factor) : 2.0 and EnergyStar rated. Cannot be used in a small confined space, needs airflow around it. Uses heat pump technology with backup electric system ensures you have plenty of hot water when it’s too cold to pull it from the air. Our local utilities in Western Washington, such as PSE have identified this as a great green product and provide excellent rebates when you buy a hybrid electric water heater. 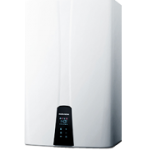 Washington Energy Services offers water heaters to fit every budget and house, including several top brands of energy efficient tankless water heaters. Call today 800-398-4663 for great savings.